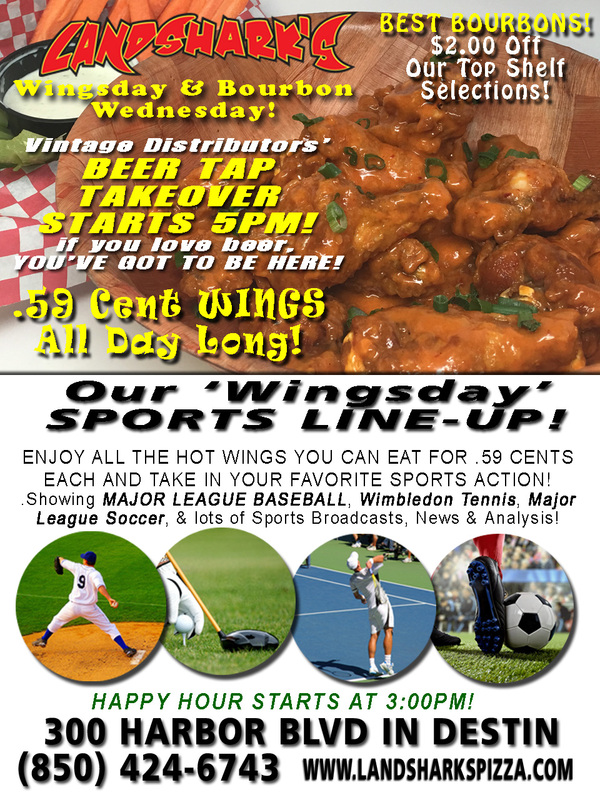 / Best Hot Wings in Destin FL / Destin FL Fun – 5PM BEER TAP TAKEOVER! 59-CENT WINGS ALL DAY! $2 OFF Top Shelf Bourbons! Destin FL Fun – 5PM BEER TAP TAKEOVER! 59-CENT WINGS ALL DAY! $2 OFF Top Shelf Bourbons! 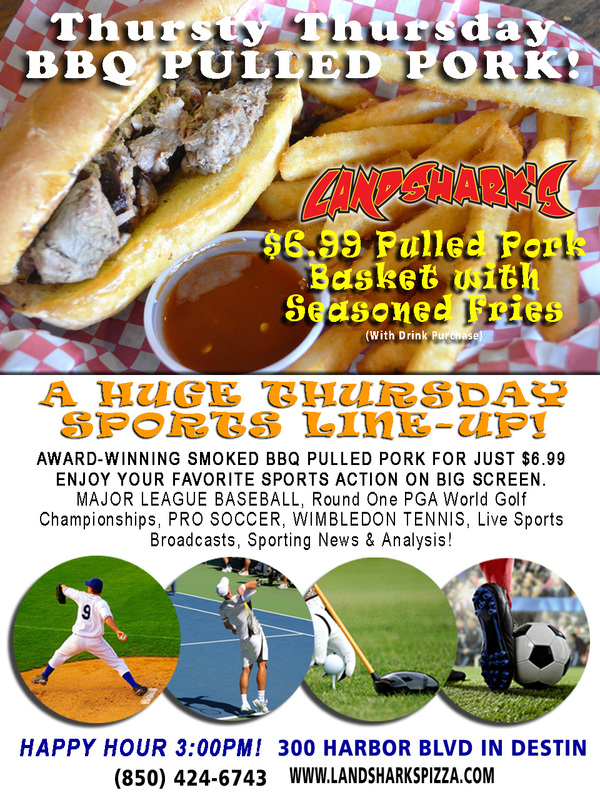 IT’S WINGSDAY & BOURBON CLUB WEDNESDAY AT LANDSHARK’S – .59 CENT WINGS ALL DAY LONG – ALL FLAVORS, ALL RUBS! THEY’RE TAKING OVER OUR TAPS TO PUT A SMILE ON YOUR FACE @5PM! THE INVASION OF THE TAP TAKEOVER! Vintage Distributors will descend upon Landshark’s at 5PM to take over the taps and serve you up some fabulous brews! COME ENJOY SOME AMAZING BEER SELECTIONS! Vintage Distributors is a Destin, Florida local wine and beer distributor. Serving the needs of the Emerald Coast for fine boutique wines and micro-breweries. SPORTS ON OUR ARMY OF BIG SCREENS! TENNIS MAJORS ACTION with WIMBLEDON continues! All week we’re bringing you pro tennis matches from tennis’ grand stage as well as bracket news, preditions & interviews. We’re also showin’ MAJOR LEAGUE BASEBALL, MAJOR LEAGUE SOCCER, & plenty of other Sports Broadcasts, Sporting News, Analysis, and Commentary! PGA Tour Golf This Week: World Golf Championships-Bridgestone Invitational from Firestone Country Club. NASCAR This Week: NASCAR XFINITY Subway Firecraker 250 & SPRINT CUP SERIES Coke 400 comin’ from Daytona International Speedway. Previous Post: « It’s TACO TUESDAY in Destin FL – Do you know where your Margarita is? 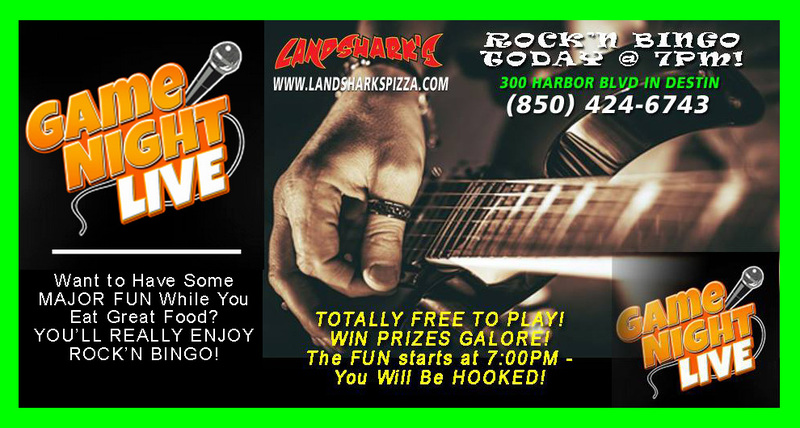 ROCK’N BINGO @ 7PM!